A new kind of pterosaur, a flying reptile from the time of the dinosaurs, has been identified by scientists from the University of Southampton, the Transylvanian Museum Society in Romania and the Museau Nacional in Rio de Janiero, Brazil. The fossilised bones come from the Late Cretaceous rocks of Sebeş-Glod in the Transylvanian Basin, Romania, which are approximately 68 million years old. The Transylvanian Basin is world-famous for its many Late Cretaceous fossils, including dinosaurs of many kinds, as well as fossilised mammals, turtles, lizards and ancient relatives of crocodiles. A paper on the new species, named Eurazhdarcho langendorfensis has been published in the international science journal PLoS One. 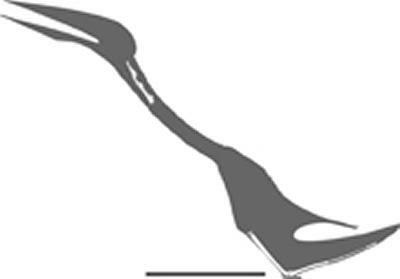 Dr Darren Naish, from the University of Southampton’s Vertebrate Palaeontology Research Group, who helped identify the new species, says: “Eurazhdarcho belong to a group of pterosaurs called the azhdarchids. These were long-necked, long-beaked pterosaurs whose wings were strongly adapted for a soaring lifestyle. Several features of their wing and hind limb bones show that they could fold their wings up and walk on all fours when needed. The discovery is the most complete example of an azhdarchid found in Europe so far and its discovery supports a long-argued theory about the behaviour of these types of creatures. Dr Gareth Dyke, Senior Lecturer in Vertebrate Palaeontology, based at the National Oceanography Centre Southampton says: “Experts have argued for years over the lifestyle and behaviour of azhdarchids. It has been suggested that they grabbed prey from the water while in flight, that they patrolled wetlands and hunted in a heron or stork-like fashion, or that they were like gigantic sandpipers, hunting by pushing their long bills into mud. Fossils from the region show that there were several places where both giant azhdarchids and small azhdarchids lived side by side. Eurazhdarcho’s discovery indicates that there were many different animals hunting different prey in the region at the same time, demonstrating a much more complicated picture of the Late Cretaceous world than first thought.